Is this what they call love? When you have it, it's a burden, without it, you're lonely. I don't understand how I can know so little about love and how it works. How I can be so bad at it when it's all I've ever wanted. All I've ever known is about leaving or being left. 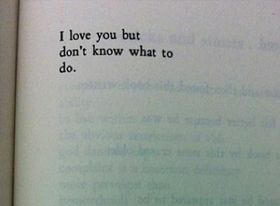 Love is a tricky thing. It varies in intensity and in the specificity of emotions. It is sometimes the most beautiful thing in the world and, at other times, its the most horrid thing weve ever come face-to-face with. Life and love are like hide and seek; people spend their whole lives looking for love, but when they finally seek it ... they hide! Why is it that the greatest irony of love is letting go when you want to hold on, and holding on when you need to let go? You can never find the right person if you can never let it go of the wrong, but at the same time the moment you feel like letting go, you remember why you held on for so long. Within you I lose myself. Without you I find myself. Wanting to be lost again. People tell me to forget about the past but what happens when that person you're with today isn't better than your last. Confused love is complicated love in which the people in love are not sure of a future together. Love can get confused because of a plethora of reasons. The underlying reasons, which are usually cited for confused love, are compatibility problems, lack of understanding between the couple, too many personality differences, ego problems, etc. None of the people who are involved in the relationship looks forward to a future with each other. This is primarily because they fail to resolve their differences and none of them wants to compromise on their thoughts, ideals, and principles. However, when you start seeing the signs of confusion and doubt in love, it is advised that you do not cling to the relationship and fight for it. Give up on something that is confusing for you and something that disrupts your state of mind. At times, you might walk out of the relationship yourself and sometimes, the other person might take the initiative. In either of the case, you should accept that the relationship had no future and the confused love ended it.